Welcome to our Horses of the World Section. This is a brand new endeavor where we try to display horses and horse activities in various locations around the world. This section will be expanded as we receive pictures and information. 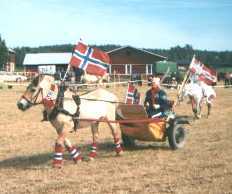 Scandanavian horses at a riding and driving "test"